Go to Biblica Direct, online at BiblicaDirect.com, for a wide selection of low cost Bibles. Biblica Direct was created to provide Bibles and biblical resources to help transform lives and share teachings. BiblicaDirect.com offers different translations, such as New International Version, New Living Translation, King James Version, Spanish Bibles, Arabic Bibles, Chinese Bibles, and Bibles in many other languages. In addition to providing the lowest prices on bulk ministry Bible orders, BiblicaDirect.com develops its resources to engage people in a deeper experience with teachings. But before you shop, be sure to get all the BiblicaDirect.com discounts, Biblica Direct promotions, and Biblica Direct coupon codes, found here at RetailSteal.com. Shipping rates in the U.S. are based on total order value. 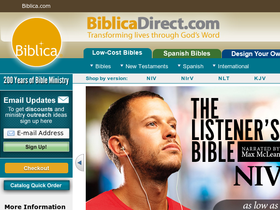 Biblica Direct offers Canada and international ordering. Orders outside the US are made by phone. See site for further information. Spend $175 or more on your order from Biblica Direct and use this coupon code to enjoy free shipping on your entire order. Click to save. Shop at Biblica Direct today and use our coupon code to receive a 5% discount on your purchase. Take 20% off when you pre-order the newest ministry material, The Books of the Bible, from BiblicaDirect.com. Click link to activate savings and use coupon code. Shop the sale room at BiblicaDirect.com to find savings up to 75% on Bibles and biblical material. Click here to get started. Shop at Biblica Direct for up to 60% savings on Scripture products. Click here to browse selection and save. Shop at BiblicaDirect.com for multimedia products, such as CDs and DVDs, starting at $0.50. Click here to shop. Shop for NLT, or New Living Translation Bibles, starting as low as $0.88! Click here to see offer and save. Shop at BiblicaDirect.com for teen and young adult Bibles for under $2. Click here to check them out.